Beautiful angelic pieces from Engelsrufer. They sent me over a few pieces and I fell inlove with these two. 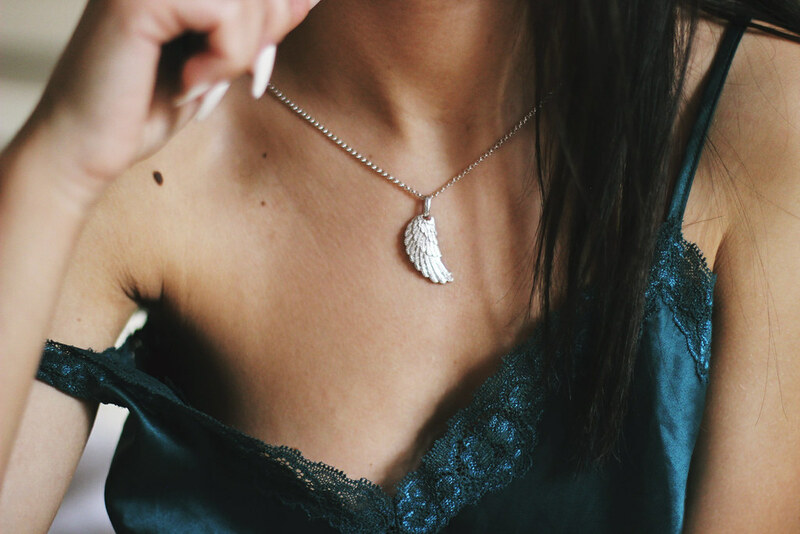 I just love the wing so much, and the double one with the wind and Fatima's hand, but I'm not quite sure how to wear it, so I wrap it round and make it into a choker. Got a lot of compliments on that one worn in that way. All their pieces seem so angelic and peaceful, I just cant even decribe it, sound weird right? Haha but trust me, look through their website and you'll see what I mean! The emerald pj's are from Lindex. I have slept with these for the past two weeks, no joke. Love the satiny feel of them, and the top has matching shorts which you cannot see in the pictures. You can check it out here for the top and here for the bottom. It actually comes in red and navy too, so tempted!!!! P.S any photographers in London? I have no one to shoot my outfits at the moment, really need to post asap!